LONTAR issue #2 (Spring 2014) is now out and available! The DRM-free ebook has been posted to Weightless Books, and can be yours for the mere paltry payment of $2.99 USD. Many, many thanks to Michael and Gavin and everyone at WB for making the issue prêt à acheter so quickly. Once again, we have a strong issue, with some really wonderful writing from a variety of locales. All of the poetry this time round comes from Singapore, which was unintended, but really showcases the poetic prowess of our Little Red Dot. Thanks to all of our talented and imaginative contributors for making it another great issue, as well as the hard work of poetry editor Kristine Ong Muslim, cutting-edge art direction from Sarah and Schooling (I mean, just how awesome is that cover?! ), and publication faith of publisher Kenny Leck. So go ahead and nab your own ebook copy of issue #2 (and pick up a copy of issue #1, in case you missed it earlier). Update: We got Boing Boinged! 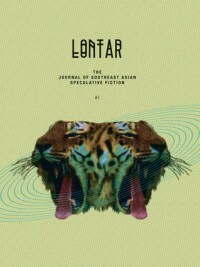 Pingback: Lontar Issue 2: Speculative Fiction in South-East Asia | Vikings, Books, etc.